Description: Thallus a broad oval frond arising from a discoid holdfast the short stipe expanding into a thick flat frond up to 50 cms long and 10 cms or so broad. Leatherly and deep blood red in colour, older fronds often split down to the stipe. Habitat: Common. Epilithic in deep rock pools of the low littoral into the sublittoral to depths of more than 35 m.
Distribution: Around the British Isles including the Shetlands and the Channel Islands. Europe: Portugal, Spain, France, the Baltic, Norway, Spitzbergen and Iceland. 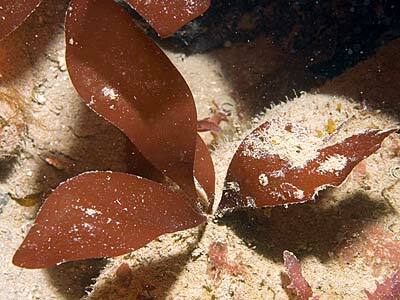 Similar Species: Palmaria palmata, the edible "Dulse" is vaguely similar, however Dilsea is much more leatherly and less branched. Leatherly nature and deep red colour of the frond. Morton, O. & Picton, B.E. (2016). Dilsea carnosa (Schmidel) Kuntze. [In] Encyclopedia of Marine Life of Britain and Ireland.